SIRT1, an NAD+-dependent deacetylase, causes deacetylation and down-regulation of its target p53. Given that p53 is an upstream regulator of the transcription of the cyclin-dependent kinase inhibitor p21/Cip1, SIRT1 is hypothesized to play a stimulatory role in carcinoma cell proliferation. We previously reported that down-regulation of SIRT1 caused the increase in p21/Cip1 in a post-transcriptional manner, suggesting that p53 is not involved in the p21/Cip1 increase and raising the question whether SIRT1 exhibits the activity other than deacetylase. In the present study, we examined whether SIRT1 down-regulation and the inhibitor for SIRT1 deacetylase activity affects p21/Cip1 and p53 expression in renal adenocarcinoma cells and normal renal cells. SIRT1 knockdown caused an increase in p53 and p21/Cip1 protein levels in renal adenocarcinoma ACHN cells but not normal renal-derived HK-2 cells. The increase in p53 in ACHN cells is unlikely to contribute to the upregulation of p21/Cip1 expression, given that SIRT1 knockdown did not increase p21/Cip1 mRNA levels in these cells. In contrast to the SIRT1-knock down assay, SIRT1 deacetylase inhibitor did not affect p53 or p21/Cip1 protein levels in ACHN cells. Therefore, SIRT1-knockdown likely stimulates p53 and p21/Cip1 protein expression in a deacetylase-independent manner. SIRT1, an NAD+-dependent deacetylase, is involved in diverse cellular processes, and has been linked to multiple disease states. SIRT1-mediated deacetylation also causes down-regulation of the SIRT1 target p53 (Vaziri et al., 2001). Given that p53 is an upstream regulator of the transcription of the cyclin-dependent kinase inhibitor p21/Cip1 (el-Deiry et al., 1993), SIRT1 is hypothesized to play a stimulatory role in carcinoma cell proliferation. We previously reported that AU-1, a spirostanol saponin isolated from Agavaceae plants, causes a transient increase in p21/Cip1 in the renal adenocarcinoma cells, ACHN (Fujino et al., 2017). Interestingly, the increase in p21/Cip1 is caused by down-regulation of SIRT1 in a post-transcriptional manner, suggesting that p53 is not involved in the p21/Cip1 increase and raising the question whether SIRT1 exhibits the activity other than deacetylase. In the present study, we examined whether SIRT1 down-regulation and the inhibitor for SIRT1 deacetylase activity affects p21/Cip1 and p53 expression in renal adenocarcinoma cells and normal renal cells. Antibodies (Abs) specific for β-actin (C-2), p21 (H-164), and p53 were purchased from Santa Cruz Biotechnology, Santa Cruz, Dallas, TX, USA. ECLTM anti-mouse IgG, horseradish peroxidase linked whole antibody (from sheep) and ECLTM anti-rabbit IgG, horseradish peroxidase linked whole antibody (from donkey) were purchased from GE Healthcare, Buckinghamshire, UK. Ex-527 and siRNA against human SIRT1 were purchased from Santa Cruz Biotechnology. miRCURY LNA Power Inhibitor for miR-21 (4100688-100) was from EXIQON, Vedbaek, Denmark. The human renal adenocarcinoma cell line ACHN and human normal renal-derived cell line HK-2 were obtained from ATCC. ACHN is a renal adenocarcinoma cell line derived from a 22 year-old man (ATCC No. CRL-1611). HK-2 is a proximal tubular cell line derived from normal human kidney. The cells were immortalized by transduction with human papilloma virus 16 (Ryan et al., 1994) (ATCC No.CRL-2190). These cell lines were maintained in Dulbecco’s modified eagle medium (DMEM) containing 10% fetal calf serum (FCS), 50 units/mL penicillin G sodium salt, and 50 μg/mL streptomycin sulfate and cultured in a humidified atmosphere of 8.5% CO2 at 37°C. In order to knockdown endogenous SIRT1, cells were seeded on 60-mm dishes at a density of 5.0 × 105 HK-2 cells or 3.0 × 105 ACHN cells per dish and transfected with siRNA against SIRT1 (50 nM) using HiPerfect Transfection Reagent (Qiagen, Hulsterweg, NLD) according to the manufacturer’s instructions. After incubating for 24 or 48 hr, cell number was counted, and protein extracts for immunoblotting analyses or total RNAs for real-time PCR analyses were prepared. In the RNA interference experiments, “Nonsilencing Control” siRNA (#1022076) from Qiagen was used as a control. Quantification of mRNA was performed using real-time PCR. Briefly, 5 μg of total RNA was reverse-transcribed using ReverTra Ace qPCR RT Master Mix (TOYOBO, Osaka, Japan). The resultant cDNA was subjected to real-time PCR analysis using a TaqMan Gene Expression Assay kit (Applied Biosystems, Tokyo, Japan). mRNA levels were determined using TaqMan assay mixtures for p21/Cip1 (Hs01121172), p53 (Hs01034249), and β-actin (4310881E). Amplification and quantification were performed using the PRISM 7000 Real-Time PCR System (Applied Biosystems). p21/Cip1 and p53 mRNA levels were normalized to those of β-actin as an internal control. Data were analyzed using Student’s t-test. Quantification of miR-21 was performed using real-time PCR. Briefly, total RNA enriched with microRNA was extracted from HK-2 and ACHN cells using a mirVana miRNA isolation kit (Life Technologies, Tokyo, Japan). Reverse transcription was performed using a TaqMan miRNA reverse transcription kit (Life Technologies) with 10 ng of total RNA. The resultant cDNA was then subjected to real-time PCR analysis using a TaqMan Gene Expression Assay kit (Life Technologies). miR-21 level was then determined via TaqMan assay mixtures (000397). Amplification and quantification were performed using a PRISM 7000 Real-Time PCR System (Applied Biosystems). Data were analyzed using Student’s t-test. Cells were washed with PBS, and cell extracts were prepared using SDS sample buffer without loading dye. After normalization of protein content via the protein assay, the dye was added to samples. The samples were subjected to SDS-PAGE and immunoblotting analyses. For detection of p21/Cip1, p53, and β-actin, PVDF membranes were incubated with primary antibody (1:200) (Santa Cruz Biotechnology) for 2 hr. Immunocomplexes on the PVDF membranes were visualized using enhanced chemiluminescence western blotting detection reagents (GE Healthcare). SIRT1 activity was determined with SIRT1 deacetylase fluorometric assay kit (EXIQON) according to the manufacturer’s instructions. The resulting fluorescence was measured at 360 nm excitation and 460 nm emission wavelengths with a fluorescent microplate reader. Data are presented as the mean ± S.E.M. of three experiments performed in triplicate and were analyzed using Student’s t-test. 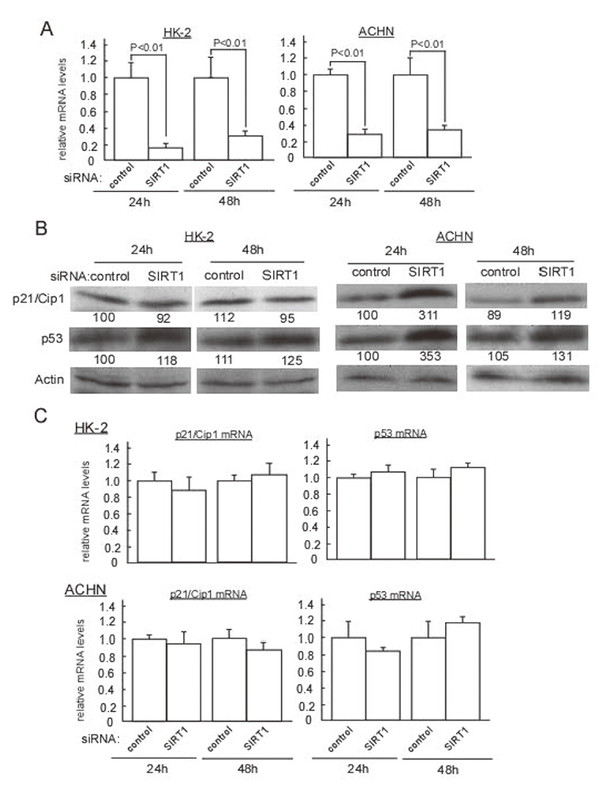 SIRT1 knockdown was performed in the renal adenocarcinoma cell line ACHN and normal renal-derived cell line HK-2, and the expression levels of p21/Cip1 and p53 were analyzed. In ACHN, SIRT1 knockdown (Fig. 1A) caused an increase in p21/Cip1 and p53 protein levels (Fig. 1B) but did not affect p21/Cip1 mRNA levels (Fig. 1C), as previously reported (Fujino et al., 2017). In contrast, SIRT1 knockdown in HK-2 cells did not affect p21/Cip1 expression (Fig. 1B and 1C). Unexpectedly, SIRT1 knockdown in HK-2 cells likewise had no effect on the expression of p53, a target of SIRT1 deacetylase (Fig. 1B). Therefore, SIRT1 knockdown caused an increase in p53 and p21/Cip1 protein levels in ACHN cells but not HK-2 cells. The increase in p53 in ACHN cells is unlikely to contribute to the upregulation of p21/Cip1 expression, given that SIRT1 knockdown did not increase p21/Cip1 mRNA levels in these cells (Fig. 1C). SIRT1 knockdown increases p53 and p21/Cip1 protein levels in renal adenocarcinoma cells but not in normal renal cells. HK-2 cells seeded at 5.0 × 105 cells or ACHN cells seeded at 3.0 × 105 cells/60-mm dish were transfected with control or SIRT1 siRNA. (A and C) After 24 and 48 hr, total RNA was extracted, and quantification of SIRT1, p21/Cip1, and p53 mRNAs was performed as described in Materials and Methods. Data are presented as the mean ± S.E.M. of three experiments performed in triplicate and analyzed using Student’s t-test. (B) After 24 and 48 hr, cell extracts were subjected to immunoblotting to detect p21/Cip1, p53, and β-actin protein. Quantification of the bands was conducting using densitometric analysis (IMAGE GAUGE 4.0). A previous study reported that miR-21 inhibitor blocked an increase in p21/Cip1 protein following SIRT1 knockdown, indicating that the increase in p21/Cip1 occured in a miR-21-dependent manner (Fujino et al., 2017). 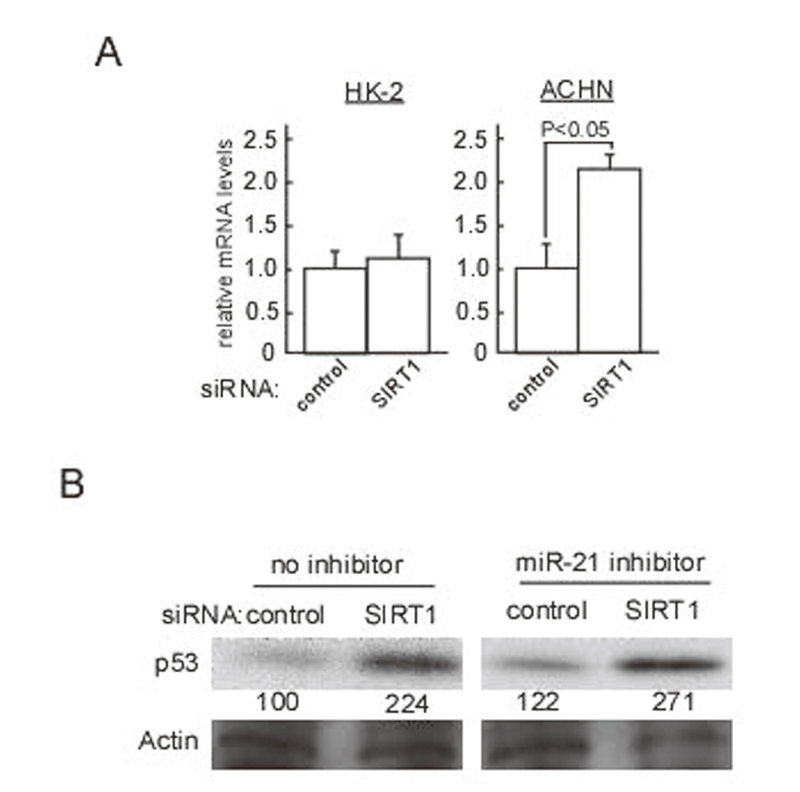 In fact, miR-21 level in ACHN cells was increased by SIRT1 knockdown whereas that in HK-2 cells was not increased (Fig. 2A). We therefore performed SIRT1 knockdown in the presence of an miR-21 inhibitor and analyzed p53 protein levels in ACHN cells. As shown in Fig. 2B, the miR-21 inhibitor did not block the increase in p53, indicating that, in contrast to p21/Cip1, miR-21 was not involved in the SIRT1 knockdown-induced increase in p53 protein. SIRT1 knockdown increases p53 protein level in renal adenocarcinoma cells in miR-21-independent manner. (A) HK-2 cells seeded at 5.0 × 105 cells or ACHN cells seeded at 3.0 × 105 cells/60-mm dish were transfected with control or SIRT1 siRNA. After 48 hr, total RNA was extracted, and quantification of miR-21 was performed as described in Materials and Methods. Data are presented as the mean ± S.E.M. of three experiments performed in triplicate and analyzed using Student’s t-test. (B) ACHN cells seeded at 3.0 × 105 cells/60-mm dish were transfected with 10 nM of an miR-21 inhibitor, or inhibitor control for 24 hr, followed by transfection with control or SIRT1 siRNA. After 24 hr, cell extracts were subjected to immunoblotting to detect p53 and β-actin protein. The SIRT1 inhibitor Ex-527 is known to inhibit the deacetylase activity of SIRT1 (Kim et al., 2011; Zeng et al., 2016). 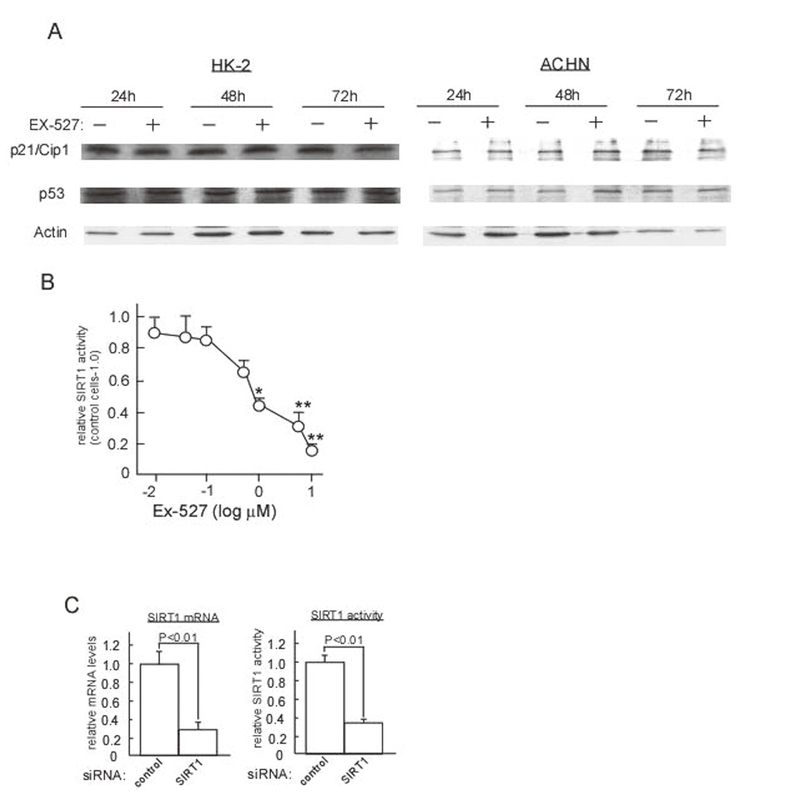 To determine whether the SIRT1 knockdown-induced increase in p53 and p21/Cip1 protein levels arises from the inhibition of deacetylase activity, ACHN and HK-2 cells were treated with 10 μM Ex-527, a concentration known to inhibit cellular SIRT1 activity (Kim et al., 2011; Zeng et al., 2016). In contrast to the SIRT1-knock down assay, SIRT1 deacetylase inhibitor did not affect p53 or p21/Cip1 protein levels in HK-2 and ACHN cells (Fig. 3A). As shown in Fig. 3B, cellular SIRT1 activity was dramatically inhibited by Ex-527, similarly with SIRT1 knockdown assay. Therefore, SIRT1-knockdown likely stimulates p53 and p21/Cip1 protein expression in a deacetylase-independent manner and SIRT1 deacetylase inhibition does not affect p53 or p21/Cip1 protein expression in HK-2 and ACHN cells. SIRT1 deacetylase inhibitor does not affect the expression of p53 or p21/Cip1 in renal adenocarcinoma cells and normal renal-derived cells. (A) HK-2 cells seeded at 5.0 × 105 cells or ACHN cells seeded at 3.0 × 105 cells/60-mm dish were treated with 10 μM Ex-527. After 24, 48, and 72 hr, cell extracts were subjected to immunoblotting to detect p21/Cip1, p53, and β-actin protein. (B) ACHN cells seeded at 3.0 × 105 cells/60-mm dish were treated with Ex-527 at the concentrations as indicated. After 48 hr, cellular SIRT1 activity was determined as described in Materials and Methods. *P < 0.05 to control cells; **P < 0.01 to control cells. (C) ACHN cells seeded at 3.0 × 105 cells/60-mm dish were transfected with control or SIRT1 siRNA for 48 hr. Left panel: total RNA was extracted, and quantification of SIRT1 was performed as described in Materials and Methods. Right panel: cellular SIRT1 activity was determined as described in Materials and Methods. Data are presented as the mean ± S.E.M. of three experiments performed in triplicate and analyzed using Student’s t-test. In summary, we revealed that SIRT1-knockdown causes an increase in p53 and p21/Cip1 protein levels in the renal adenocarcinoma cell line ACHN in a deacetylase-independent manner. Given that this does not occur in normal renal cells, SIRT1 knockdown may be useful for establishing renal carcinoma suppression without toxicity in normal renal cells. The finding that SIRT1 knockdown increases p21/Cip1 and p53 protein levels in ACHN cells in a deacetylase-independent manner was unexpected. Interestingly, several reports have indicated that SIRT1 exhibits transcription factor activity (Jang et al., 2017; Oka et al., 2011). Given that SIRT1 knockdown-induced up-regulation of p21/Cip1 is miR-21-dependent, examination of whether SIRT1 regulates the expression of miR-21 or other micro RNAs may reveal a novel function of SIRT1 as a transcription factor. We thank Ken Ando for helpful advice and discussions. This work was supported in part by a grant from the Japan Private School Promotion Foundation. el-Deiry, W.S., Tokino, T., Velculescu, V.E., Levy, D.B., Parsons, R., Trent, J.M., Lin, D., Mercer, W.E., Kinzler, K.W. and Vogelstein, B. (1993): WAF1, a potential mediator of p53 tumor suppression. Cell, 75, 817-825. Fujino, T., Yokosuka, A., Higurashi, H., Yokokawa, R., Sakurai, R., Harashima, W., Miki, Y., Fujiwara, Y., Mimaki, Y. and Hayakawa, M. (2017): AU-1 from Agavaceae plants causes transient increase in p21/Cip1 expression in renal adenocarcinoma ACHN cells in an miR-34-dependent manner. J. Nat. Med., 71, 36-43. Jang, M.J., Park, U.H., Kim, J.W., Choi, H., Um, S.J. and Kim, E.J. (2017): CACUL1 reciprocally regulates SIRT1 and LSD1 to repress PPARγ and inhibit adipogenesis. Cell Death Dis., 8, 3201. Kim, D.H., Jung, Y.J., Lee, J.E., Lee, A.S., Kang, K.P., Lee, S., Park, S.K., Han, M.K., Lee, S.Y., Ramkumar, K.M., Sung, M.J. and Kim, W. (2011): SIRT1 activation by resveratrol ameliorates cisplatin-induced renal injury through deacetylation of p53. Am. J. Physiol. Renal Physiol., 301, F427-F435. Oka, S., Alcendor, R., Zhai, P., Park, J.Y., Shao, D., Cho, J., Yamamoto, T., Tian, B. and Sadoshima, J. (2011): PPARα-Sirt1 complex mediates cardiac hypertrophy and failure through suppression of the ERR transcriptional pathway. Cell Metab., 14, 598-611. Ryan, M.J., Johnson, G., Kirk, J., Fuerstenberg, S.M., Zager, R.A. and Torok-Storb, B. (1994): HK-2: an immortalized proximal tubule epithelial cell line from normal adult human kidney. Kidney Int., 45, 48-57. Vaziri, H., Dessain, S.K., Ng Eaton, E., Imai, S.I., Frye, R.A., Pandita, T.K., Guarente, L. and Weinberg, R.A. (2001): hSIR2(SIRT1) functions as an NAD-dependent p53 deacetylase. Cell, 107, 149-159. Zeng, Z., Chen, Z., Xu, S., Zhang, Q., Wang, X., Gao, Y. and Zhao, K.S. (2016): Polydatin protecting kidneys against hemorrhagic shock-induced mitochondrial dysfunction via SIRT1 activation and p53 deacetylation. Oxid. Med. Cell. Longev., 2016, 1737185.